Few traditional Newfoundland bands have risen as quickly in the ranks as Rum Ragged. Formed by singer/guitarist Mark Manning and singer/accordion player Aaron Collis just two years ago, Rum Ragged has garnered respect from a loyal, ever-growing fan base as well as their musical peers. From spirited instrumentals to heartfelt ballads, they pay homage to the greats that came before them while carving out a fresh, unique sound of their own. 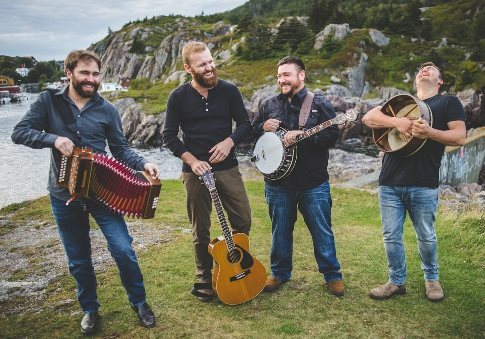 Rum Ragged released their debut album in the summer of 2016, and already it has received widespread attention and acclaim with two Music NL nominations for Album of the Year and Folk Roots Recording. They are also the grand prize winners of the Lamb’s Rum theme song contest, from hundreds of Canada wide entries. Manning and Collis have recently expanded to a four-piece, with Anthony Chafe on bodhran and Michael Boone on bass and banjo. Rum Ragged now represents the best that Newfoundland has to offer in the traditional genre. Rum Ragged is at the Victoria Playhouse on July 16th.